Many times when we start writing a blog we often like to share some links with our readers. For instance you might want to share links to other blogs you own or even display links to blogs run by your friends. WordPress allows us to create Links Menu and show them up on the website in a Menu for easy navigation. 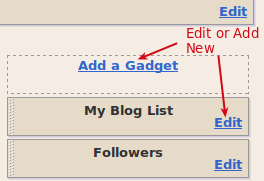 In Blogger.com you might be familiar with “Blog List“, “Link List” and “List“. These are gadgets that you need to add and they basically display links to other blogs or websites which are your favorite (see image below). The same way you can add external links in your WordPress blog. 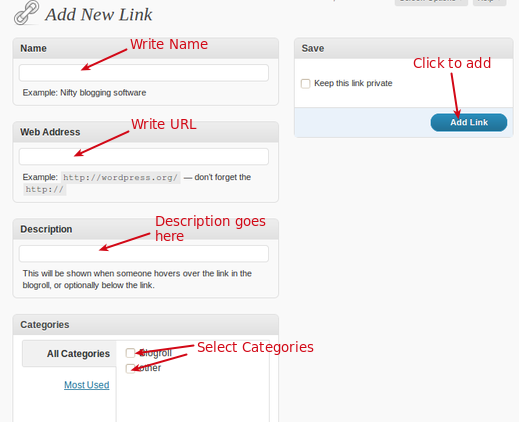 In WordPress you can distinguish links by assigning Link Categories. This is very similar to how we assign categories to posts. 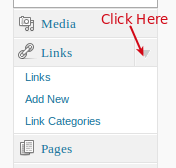 Click on Links menu, You will get three options Links, Add New and Link Categories (see image below). Click on Add New we get started with adding links for the blog. 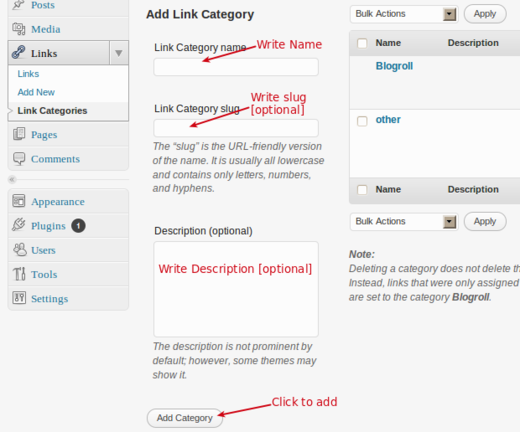 WordPress by default provides a Link Category which is named “Blogroll”. The default Blogroll category cannot be deleted but we can rename it. We can assign only Link Categories to links and not assign categories that were created for posts. Click on Add New option and we get the area where you can add external links. Here we can add Name, URL, Description and assign Categories for the link. For displaying these links in the blog with WordPress we need to use widgets or menus. Once you click on Widgets on the sidebar of the Dashboard we can drag and drop the Link Widget where we want the links to be displayed on the blog. Just like Blogger.com we can also show links to our favourite blogs with WordPress. This is possible on Blogger.com only by adding gadgets. With WordPress we can not only add links on the blog directly but also display them based on the categories.